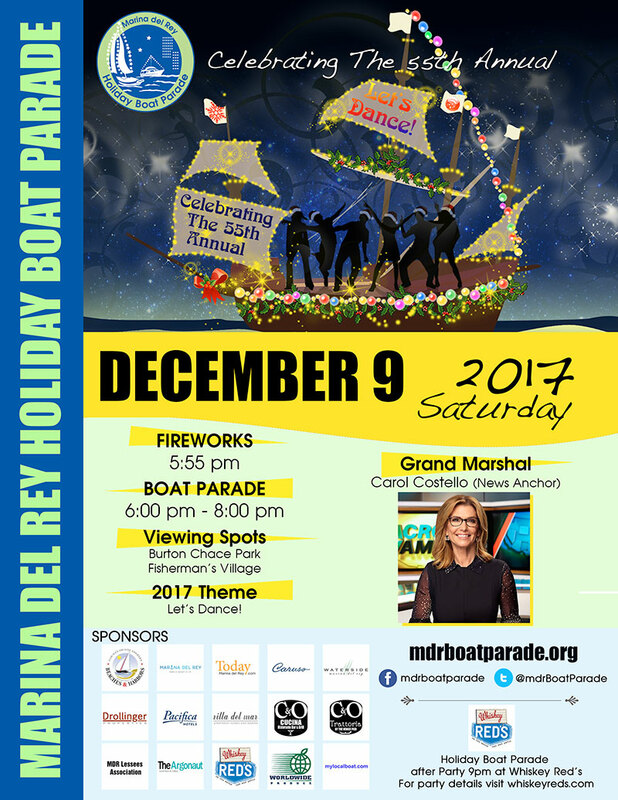 The 55th Annual Marina del Rey Holiday Boat Parade is just around the corner! Attendees can enjoy a festive day in the Marina del Rey throughout the day. The Department of Beaches and Harbors organizes the 3rd Annual Snow Wonder event at Burton Chace Park from 12pm to 6pm. It’s a Free event! Children can enjoy real snow, sledding, arts & crafts, face painting, live DJ, food trucks, and much more. About 50 boats dressed up with lots of lights, with music, live bands and vocals will circle the main channel of Marina del Rey Harbor for about 2 hours. Fireworks starts at 5:55pm follow by the Parade at 6pm. 2017 theme is “Let’s Dance!” and grand marshal is Carol Costello. It’s not too late to enter your boat!